I was so thrilled that Laney Sammons, author of Guided Math: A Framework for Mathematics Instruction agreed to participate in a Q & A session with us as we studied the book. A great BIG thank you to Laney for taking the time out of her summer to spend time considering our questions & giving us some support as we move towards implementing guided math in our classrooms. We had questions....here are the answers! Laney - Below are some of my ideas in response to these questions, but they are not definitive. The framework is a flexible one, and I encourage teachers to tweak it to fit their needs. I constantly learn from the teachers with whom I work as I see or hear about how Guided Math works in their classrooms. What ideas do you have when independent practice students have not finished their expected work (this is when all students are changing to the next math rotation, teacher starts with a new Math group)? I think first I would want to determine why they are not finishing the expected work. Is it because they were distracted or off-task? Or, is there some confusion about the work assigned? If they are distracted or off-task, I would want to take some time to revisit the procedures and routines for Math Workshop. Model expectations and have students practice and then reflect and self-assess their work behavior together as a class. Which of the procedures or routines have they followed well? Which need more work? If the problem is with just one or two students, I might have them sit beside me at a desk as I work with the small group until they are able to work independently. If they know this is the consequence, they usually shape up pretty quickly. They would usually much rather work independently during Math Workshop rather than sit with the teacher. If there is confusion about the work, I would first make sure that it is clearly introduced--perhaps in a small-group setting until I am sure students understand the expectations. I also recommend that the work assigned be review and maintenance of previously mastered math concepts and skills or else work aimed at developing computational fluency. If the work assigned is on the topic being taught in the small group setting, it is not likely that students will be able to do it independently and accurately. It is much better to use that time to maintain and deepen understanding. Realistically, however, just as when work is assigned for guided practice whole class, there will always be students who won’t finish their work. We just have to do whatever we can to motivate these students and minimize their effect on other students. I have students who are very far below grade level. These children have a very difficult time being independent for the length of time needed. Do you have suggestions for how to help these children be successful during independent work time? Laney - You may want to structure your small-group instruction so that you spend less time with students who quickly catch on and more time with students who need more scaffolding and support. Usually, I have struggling students work independently first--when they are fresh. I may see two other groups first for brief lessons and then see these students for a lengthier lesson. Allocate time given to small groups by equity, not necessarily equality. You may also want to partner these students with other students who may be working just above their level, but have more stamina for independent work. Avoid pairing them with students working at a much higher level--which is too often frustrating for both students. And, finally, establish very clear procedures and routines. Help students develop an understanding of what independent work entails--what it looks like, sounds like--and why it is important. Take time to teach and practice them at the beginning of the year and revisit them whenever necessary. When these students have trouble, unless absolutely necessary, try to avoid interrupting your small-group lesson. Develop nonverbal cues to remind students of your expectations and address problems with them after small-group instruction. As suggested in the preceding response, if needed, you may have a student work beside you as a consequence of unacceptable work behavior. Give them the responsibility of proving they should have the privilege of working independently. How do you recommend dealing with student absences, particularly for those students who are already struggling? Student absences are always difficult to deal with--especially with struggling students. The small-group format, however, makes it a little easier. Sometimes, I was able to have the student who had been absent sit beside me during the small-group lesson, and I could try to “catch” him up on what had been missed. If needed, I could have the student participate in more than one group lesson that day. I also tried to confer with these students whenever I had a chance. That might be as students entered the classroom and were engaged in completing a Math Stretch, during silent reading time, during recess, while other students were at the Media Center, or whenever I could steal a couple of minutes. Working with just one student or a couple of students, it was often much quicker to share the material that had been missed. How do you incorporate the math curriculum your school uses and the Guided Math concept? I struggle trying to figure out how to make all the components work from Guided Math and still have students complete the required math pages from the curriculum each day. As you are just beginning to implement Guided Math, you may want to focus on the small-group instruction and Math Workshop components, and then add in the others as you become more comfortable with it. I suggest beginning with these because small-group instruction is the “heart” of Guided Math and without a well-organized and managed Math Workshop, small-group instruction isn’t possible. I’m not sure what curriculum you use or about your required math pages (that you must teach or pages to be completed by students). Most math programs have many resources that may be adapted for Guided Math. If your curriculum dictates what needs to be taught, use whatever resources provided to design a lesson that address the standards being taught and your students’ needs. I would often draw upon the basic lesson provided, but try to increase the student engagement, plan challenging questions for students as they worked, and try to ensure that students communicated their mathematical thinking both orally and in writing with both me and their classmates. If there are pages that students need to complete, once you feel students are capable of completing them independently with accuracy, you can send them (individually or as a group) to their desks to complete them before they begin their math work station tasks. You may choose to have them try a few problems during in the small group to be sure they are ready. Those who aren’t may work a few more problems with you or stay with you for the next group lesson, so you can continue to support their learning. Within all of the math programs with which I have worked, I have found warm-up activities that can be adapted as a Math Stretch, lessons that can be adapted, ideas for remediation and additional work with manipulatives, ideas for additional challenge, and games or independent activities for students that can become math work stations. What resources do you recommend for finding the "just right" materials for math workshop activities? Do you have a favorite? As I mentioned earlier, math work station tasks should be geared to review/maintenance or building fluency. The distributed practice you provide with these tasks helps students retain and deepen their understanding. It is best to use some of the same materials and games you have already used to teach the concepts and skills being practiced. That way, students are already familiar with them. My favorites are using simple and readily available materials and games in which the basic rules remain the same, while the content may vary. For example, use number cards (or playing cards with the face cards removed) for the game of War. Students may be simple comparing numbers through ten; draw two cards to create double digit numbers to compare; draw two cards, add them, and compare the sums; draw two cards, multiply, and compare the products; draw two cards, create a fraction, and compare; draw 3 cards, create a 3 digit number, and compare; draw two cards, create a single digit number with an exponent, and compare; and so on. The basic game is only taught once saving lots of instructional time. Other simple materials that can be used in many ways are dominoes and number cubes (dice). Just search the web for lots of ideas for these simple materials. These games may also be differentiated by having slightly different rules for different students based on their learning needs. For accountability, require students to record their work on a recording sheet or in a math journal. For example, if playing War, students would record each draw (5>4, or 7=7). By just glancing (not something else to grade) through the recordings, you will be able to tell whether students were working (playing the game) and whether they understood what they were doing. It provides a quick and easy formative assessment and allows you to correct misconceptions. I teach sixth grade math in a traditional setting - I have a 53 minute period for each class. How do I manage this time period for guided math? Any tips would be appreciated! I have the greatest admiration for sixth grade teachers. Having taught kindergarten, second grade, sixth grade, high school kids who were on judicial probation and suspended from school, and college students, I found sixth grade one of the most challenging and rewarding. I must say, though, that in many ways they were quite similar to my kindergarten students. I was fortunate when I taught sixth grade in that I taught a self-contained class, thus I had more flexibility than you. My first recommendation is to consider eliminating mini lessons unless there is some compelling reason for whole class instruction (i.e., an activating strategy, reading a piece of math-related literature, having a math huddle). I have found that initial instruction is far more effective in small groups where you can address gaps in foundational knowledge and skills quickly, maintain attention, easily use manipulatives, engage in math conversation with your students, continually informally assess understanding, and provide additional challenge when needed. I think I would begin with a brief warm-up to be completed as students enter your classroom--very brief! Then, you might consider one of two models. I don’t know how many students are in each of your classes, but if you can divide your class into 3 groups, you may be able to meet with each group every day for up to 15 minutes per group. I would recommend that you try to meet with your groups according to their needs. If you can work with a group who may need less instruction (maybe 7 minutes and then complete their work independently) see them first, another group may need 10 minutes, while a struggling group could then receive 28 minutes with you. All of those times may vary, but the first two groups would be no longer than 15 minutes, while the group needing more scaffolding could be longer. This works well when the independent math tasks provided are sufficient for students to work throughout the period rather than having to rotate from one to another. With another model, you may have a group who needs less instructional time and can be assigned to work independently during the week. You may see them only once or twice, but check in with them during the week. You may have four groups, but see only one of them daily (the one with the greatest need of support). This is similar to some of the Guided Reading models. Be creative and see what works best for you. Nothing will ever be perfect, but I truly feel the small group setting is best for students and strongly supports the rigor demanded by the CCSS and the Standards for Mathematical Practice or if you state has not adopted the CCSS, the NCTM Process Standards. How do you best fit in individual conferences? Whenever you can! Some teachers prefer to have a set day for conferring. While students work independently on math work station tasks, they confer with selected students. I used to confer with students whenever I could fit it in. Sometimes, I met with students just after they put up their book bags and got ready for the day. I might ask a student to stay with me a minute at the end of a small group lesson. I might decide to see just two groups one day and spend the additional time conferring. So as I suggested in the last response, be creative. Take advantage of every minute you have. Do you find it best to set up a schedule so that all students are conference with during a specific time frame (like each week or two weeks)? I found that there were some students I needed to confer with more frequently than others. I did my best to confer with each student at least once a month, but for some students, it was much more often. Keep in mind that you can use your conferences strategically. As you confer with a student at his/her desk or table, there are usually several other students who are listening intently to your conversation and picking up on the teaching point you are making. I teach a mixed 5th / 6th grade math class which is considered a Tier 2 intervention group. As with any class, there are a variety of developmental levels within these groups, and I have 2 different grade level curriculums to teach. I KNOW that guided math is going to be the answer to help me meet the needs of my students, but I'm not sure how to pull it all together in only 70 minutes. What guidance or suggestions can you give me? You definitely have a wonderful challenge! For you, knowing the grade level progression of the standards you are teaching is imperative. Know what your students should already know and where they are headed. What are foundational knowledge and skills for these grade levels? How will you know if your students have them? Where will the standards you are teaching lead? The composition of your small groups will change depending on the concepts being taught, and you have the flexibility of grouping your 5th and 6th grade students according to their needs. Once you identify the foundational knowledge your students need to be successful with the lesson you will be teaching, devise a simple assessment to let you know if any of your students lack that knowledge. This will allow you to group students by need. Plan how to address those deficiencies quickly so that these students can more on to the standards for their grade level. Be sure to not only plan the scaffolding these students need, but also how to withdraw that scaffolding so they become independent. Focus on the links between the concrete and the abstract to support your students in making that transition. We focus so much on the deficits of these students, that too often we overlook the importance of helping them see not only the relevance of math to their own lives, but also that mathematics is a living discipline--a puzzle that people have struggled with over thousands of year. Any AHA moments for you? I know I am thinking I can do this! I was a little intimidated by the individual conferencing. "When can I get this done?" "How can I get to everyone?!" Laney's answer reassures me that I CAN do this. Make sure you check in Sunday...we're moving into Assessments in Guided Math. 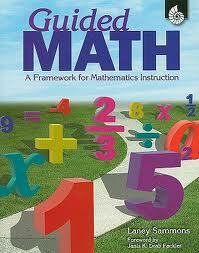 Thank you so much for all the work you have done on the Guided Math Book Study. I have learned many things by simply reading everyone's posts. What an honor to have the author of the book to join in! I have left you the Versatile Blogger Award as a thank you for all of the wonderful ideas that you share on your fantastic blog. Please visit mrsrhodesscholars.blogspot.com to accept your award. Thank you to Ms. Sammons for taking the time to address questions posed by those of us who are ready to revamp our math instruction. I am really excited about the next school year and trying these strategies.